Observed on a heavily grazed pasture west of Eldoret, Nairobi, Kenya. November 2012. From Wikipedia: The Northern Wheatear or Wheatear is a passerine bird that was formerly classed as a member of the thrush family Turdidae, but is now more generally considered to be an Old World flycatcher, Muscicapidae. 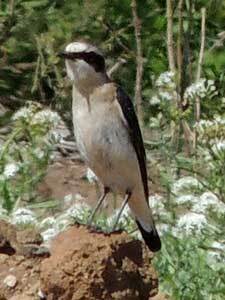 It is the most widespread member of the wheatear genus Oenanthe in Europe and Asia. 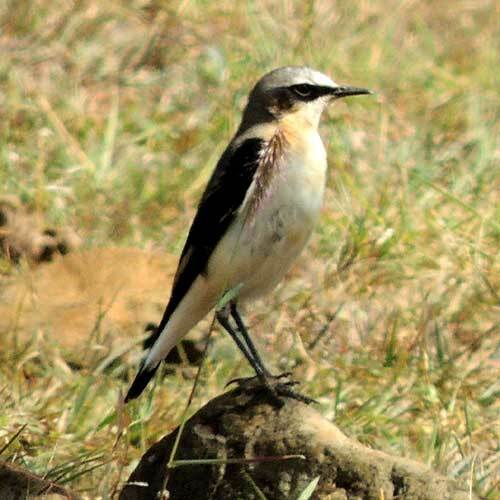 The Northern Wheatear is a migratory insectivorous species breeding in open stony country in Europe and Asia with footholds in northeastern Canada and Greenland as well as in northwestern Canada and Alaska. It nests in rock crevices and rabbit burrows. All birds winter in Africa present from October to April. Another observed at Lake Elementaita, Dec. 2015.